Angina, from the original Latin, means to choke or throttle. It only begins to describe the effects of this condition on the heart. Angina, indeed, is chest pain, tightness or other discomfort in an area of the heart that is not getting enough oxygen-filled blood. It’s not uncommon to hear people describe it as indigestion. Angina usually announces itself with pain or discomfort behind the breastbone. The tightness, aching, pressure and burning sensation can span the entire chest and beyond. If you’re experiencing angina, sometimes even your teeth hurt. But you’re not having a heart attack. Stable: Your doctor might call it angina pectoris, but this is chest pain or discomfort caused by coronary heart disease. It’s the most common angina and it happens regularly, usually during physical activity (or emotional stress). You’ll know it’s coming and that it will last only minutes. Resting, or taking angina medication, usually relieves the pain. Unstable: Less predictable, not dependent on physical activity and possibly more frequent than stable angina. Consider an episode of unstable angina a warning: This is your body telling you a heart attack might be next. Pain can last up to 30 minutes and may not respond to rest or medication. Get emergency treatment as soon as possible. Microvascular: Pain, more intense and longer-lasting than other types of angina, that’s linked to coronary microvascular disease affecting the heart’s smallest coronary artery blood vessels. This is more typical in women, who are less likely than men to have blockages in coronary arteries. Variant (also known as Prinzmetal’s and angina inversa): Pain caused by a spasm in a coronary artery, a rare condition with a specific timeframe: It usually happens sometime between midnight and morning. Depending on how much the arteries constrict because of the spasm, blood flow to the heart can either slow or stop. The pain, often intense, is relieved by medication. Angina is often an indicator of coronary artery disease, with reduced flow of oxygenated blood to the heart. Why isn’t your heart getting enough blood (and oxygen), a condition called ischemia? 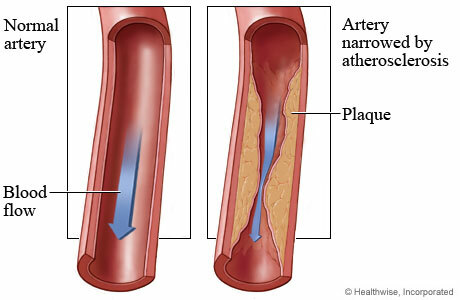 Most often, it’s because cholesterol has accumulated around the artery walls, forming hard plaques (atherosclerosis). Narrowed arteries make you vulnerable to angina. But it doesn’t happen all the time because your heart doesn’t need as much oxygen when you’re not active. Once you increase demands on your heart, during exercise or other physical activity, your heart’s increased demand for oxygen could cause angina. Your doctor must evaluate the origins of your angina before determining your chances of having a heart attack. Blood tests: Cholesterol, fat, protein and sugar levels. Chest X-ray: A view of the heart and lungs reveal a reason for the chest pain. Electrocardiogram: By reviewing the heart’s electrical activity, your doctor can determine if the heart lacks oxygen and if the blood flow through it is diminished. This test can also reveal if you’re having a heart attack. Stress test: Walk on a treadmill as your blood pressure and electrocardiogram readings are monitored. Coronary angiogram: Dye and X-ray imaging give a good picture of what’s happening inside your coronary arteries. Nitrates: By relaxing and widening your blood vessels, more blood reaches your heart. Statins: These drugs lower LDL (the “bad”) cholesterol by blocking an enzyme in the liver required to make cholesterol. Beta blockers: Reduce blood pressure by blocking the effects of adrenaline, causing the heart to beat slower. Blood clot prevention: A daily aspirin, on your doctor’s advice, makes it harder for blood clots to form. This antiplatelet drug allows blood a freer path through narrowed arteries. Anticoagulants, such as clopidogrel (Plavix), make it more difficult for platelets to bind together and form a clot. If medication and lifestyle changes fail, your doctor might treat angina with either angioplasty or coronary artery bypass surgery. Coronary artery bypass surgery: A healthy blood vessel from another part of your body (arm, chest or leg), connected to heart arteries, bypasses the blocked or narrowed artery. Cardiac rehabilitation helps patients lose weight, lower their cholesterol, improve diabetes and reduce anxiety and depression after heart-related illnesses and procedures. Why is cardiac rehab so important? These programs are designed to help patients regain strength and stay healthy with supervised exercise sessions, education on nutrition, medication and general lifestyle changes and choices. For more information on the Hartford Hospital Cardiac Rehabilitation program, one of only a handful in the state accredited by the American Association of Cardiovascular Rehabilitation, click here .